Award winning marching band drill, custom and stock shows. ~ See the show before you order. Pay for the drill after delivery. First year teachers can have a stock show FOR FREE. Use all the discounts and get a 20 page custom drill for less than $600. Welcome to Bandtek drill design. I've written drill for marching bands since 1983. During that time, I've learned a lot about how to teach kids, how to coordinate shows, and how to design drill that helps students and directors succeed. My marching band drill has high general effect, is easy to teach and march, and is written to showcase music. My drill designs are exciting to watch from the top of a high box, or from the stands at a high school. My drill is custom designed so that your marching band show is unique and exciting. The drill also comes with detailed instructions written on each chart that tell the counts and measure numbers for that particular page of drill. The students learn the drill by associating it to the musical phrase. That makes the drill easier to learn and teach. Marching band drill designs by Bandtek makes your band look good. That's a big part of why bands in 36 states have marched marching band drill designed by Bandtek, and why those marching bands have won first place trophies in at least 18 states. Marching band is fun, and doing it well makes it even more fun. Every custom marching band drill is video animated and posted to Youtube so you can plan your rehearsals, and so the students can see what they're going to learn before they ever step onto the field. I use Pyware, and have since 1987. It provides clean, easy to read charts that speed up the teaching process and allow you to spend more of your marching band rehearsal time on music. When the drill is easier to learn, the music sounds better. The Pyware 3D Viewer app lets each student see the whole drill and their individual position, right on their mobile device. If you purchase custom drill from Bandtek, you receive the pyware files at no extra charge. If you want coordinate sheets, or pdf files, they are also included. Band directors are the key to student succes, and student success is my goal. That's why I give band directors individual attention and custom work. I write your custom drill for your band and you have exclusive rights for that year. You will never see another band marching your same show. If you have questions and need some explanation, you can call me on my cell phone. There's no extra charge. If you'd like to send a video for critique, or help rehearsal planning, there's no extra charge. I believe, and experience has shown, that helping kids succeed is good for band directors, and happy band directors come back for another show. When you choose marching band drill by Bandtek Drill Design, you might be in for a new experience. Each page of drill has instructions listing your band, the year, the song, the measures marched for that page, and clear directions written so that students understand what they mean. 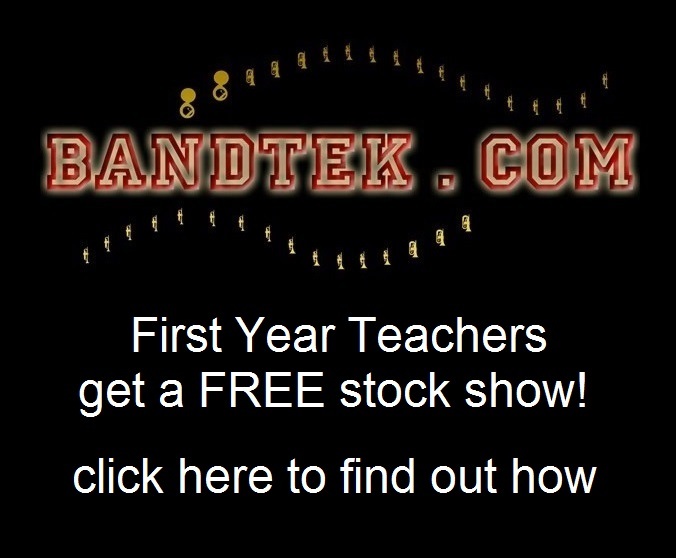 Low price, director control, and a commitment to student acheivement is part of why college and high school bands from around the country choose Bandtek.